George Morland (1763–1804), Guinea Pigs (1792), oil on canvas, dimensions not known, McManus: Dundee's Art Galleries and Museums, Dundee, Scotland. The Athenaeum. Having recently posted this article about Edward Charles Volkert (1871-1935), America’s cattle painter, I mentioned that I had been intending to write about one of the best British painters who specialised in rural scenes and farm animals: George Morland (1763–1804). Morland was probably one of the most talented painters in the UK during the 1700s, had one of the most eventful lives, and sadly died in tragic circumstances. I am surprised that no one has yet used his life as the basis for historical fiction. He was born in London, into an established family of painters. He was taught to draw at an early age, and when he was only ten he exhibited chalk drawings at the Royal Academy, which had been established five years earlier. He copied Dutch and Flemish masters, and Sir Joshua Reynolds gave him permission to copy his paintings. When he was only seventeen, his paintings were being engraved, and proved a commercial success. He left home in 1784 or 1785, and developed a lifestyle of intensive and highly productive painting, combined with heavy drinking, which brought many of his friends to despair. He first lived in the house of a picture dealer, who proved a harder task-master than his father. 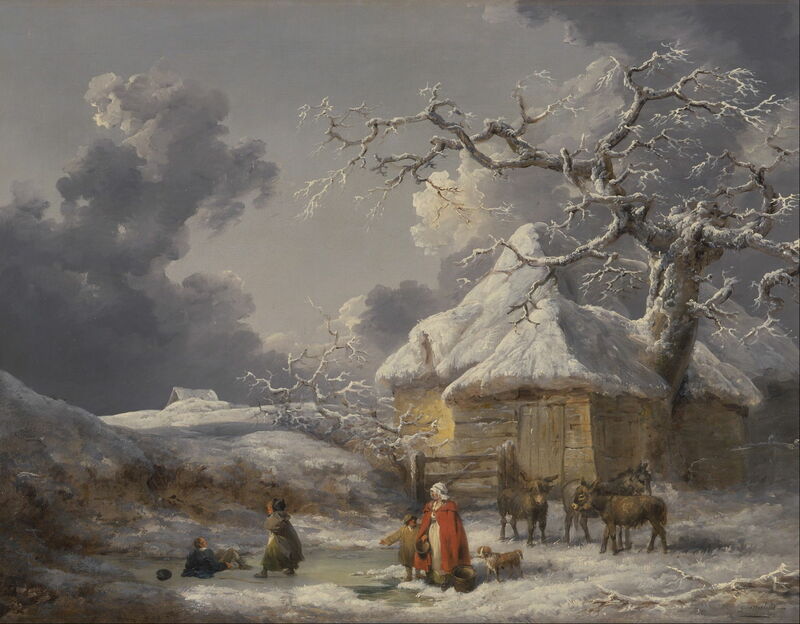 George Morland (1763–1804), Winter Landscape with Figures (c 1785), oil on canvas, 72.4 x 92.7 cm, Yale Center for British Art, New Haven, CT. Wikimedia Commons. 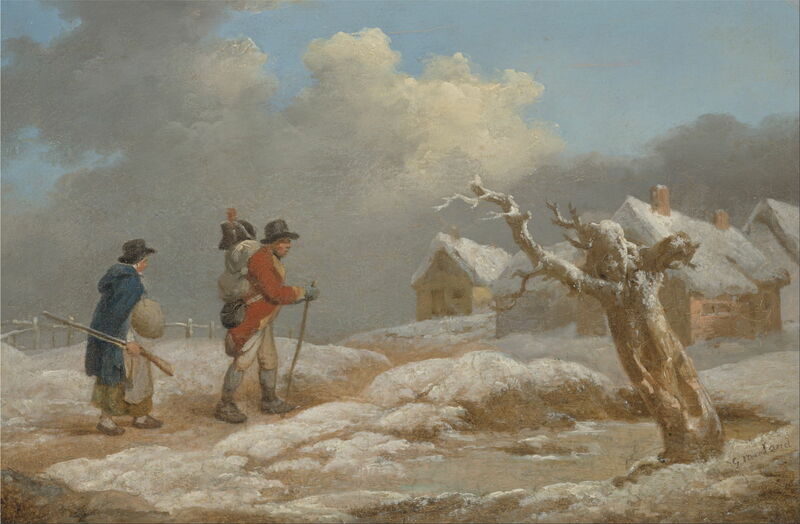 Over this period, the British climate was unusually harsh, with many winters in which the snow was deep and prolonged, even in the south of the country, something he shows well in his early Winter Landscape with Figures (c 1785). In the summer of 1785, he escaped from the clutches of the picture dealer, and painted portraits in Margate, where he fell in love with a maid. He visited St Omer in France briefly. He then returned to London the following year, lodging in Kensal Green, where he made friends with William Ward, a famous engraver. In 1786, Morland married Ward’s sister, and just a month later, Ward married Morland’s sister. Unfortunately the two couples decided to live together in Marylebone, London, which only worked for three months. Morland moved around various lodging houses in London, painting intensively, then spending the proceeds on drink. He was particularly fond of rural if not rustic scenes, and visited the Isle of Wight on several occasions from late 1789, to paint the dramatic forms of its coastline. George Morland (1763–1804), A Party Angling (1789), oil on canvas, 63.5 x 76.2 cm, Yale Center for British Art, New Haven, CT. Wikimedia Commons. 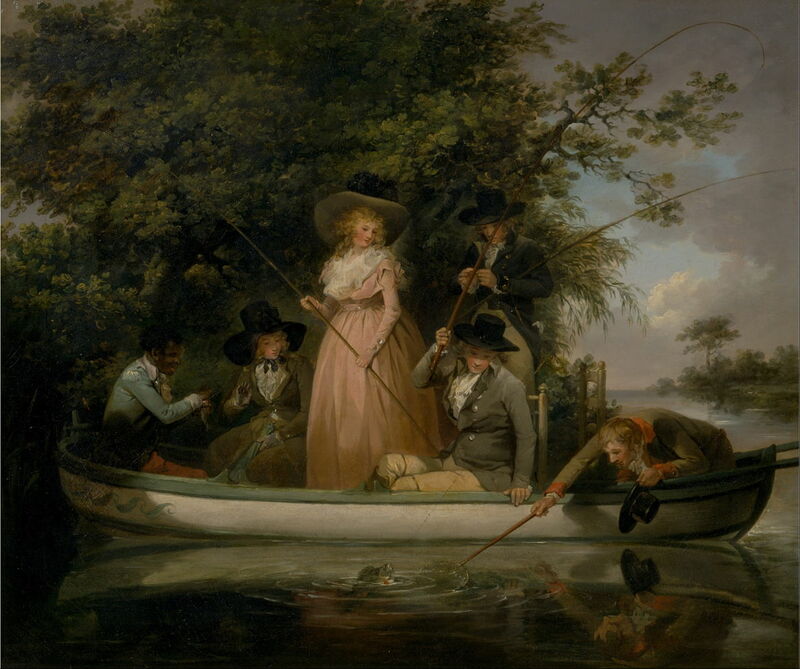 A Party Angling (1789) is one a series of paintings which he made, showing the country sporting pursuits of the gentry of the day. Several of these featured African slaves, and he took a bold stance in support of the abolition of the slave trade. 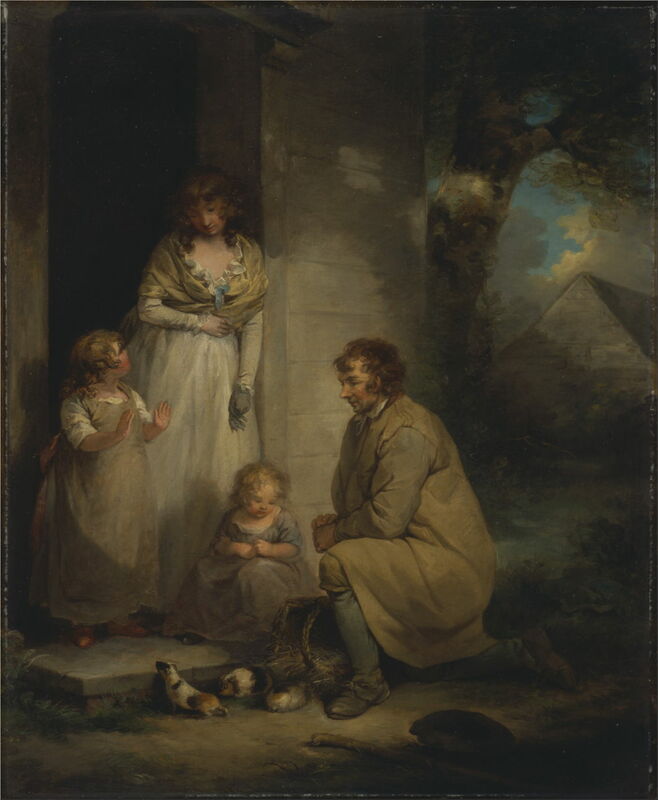 George Morland (1763–1804), Selling Guinea Pigs (c 1789), oil on canvas, 76.2 x 63.5 cm, Yale Center for British Art, New Haven, CT. Wikimedia Commons. Guinea pigs had been introduced as exotic pets in Europe in about 1575, and still had considerable novelty value when Morland was painting. His Selling Guinea Pigs (c 1789) was very successful as a print, with 500 copies selling within just a few weeks. In his early career, he painted many works showing children and their lifestyles, which tailed off as he developed his mature style and market. George Morland (1763–1804), St. James’s Park (1788-90), oil on canvas, 40.6 x 48.3 cm, Yale Center for British Art, New Haven, CT. Wikimedia Commons. St. James’s Park (1788-90) shows a military family together in what is now a central London park, but which was in Morland’s day quite rural, even with the cow being milked at the left. The bright red cheeks may be symbolic reflections of alcohol consumption: several of Morland’s earlier paintings were quite moralising. George Morland (1763–1804), A Soldier’s Return (c 1790), oil on panel, 17.5 x 27 cm, Yale Center for British Art, New Haven, CT. Wikimedia Commons. 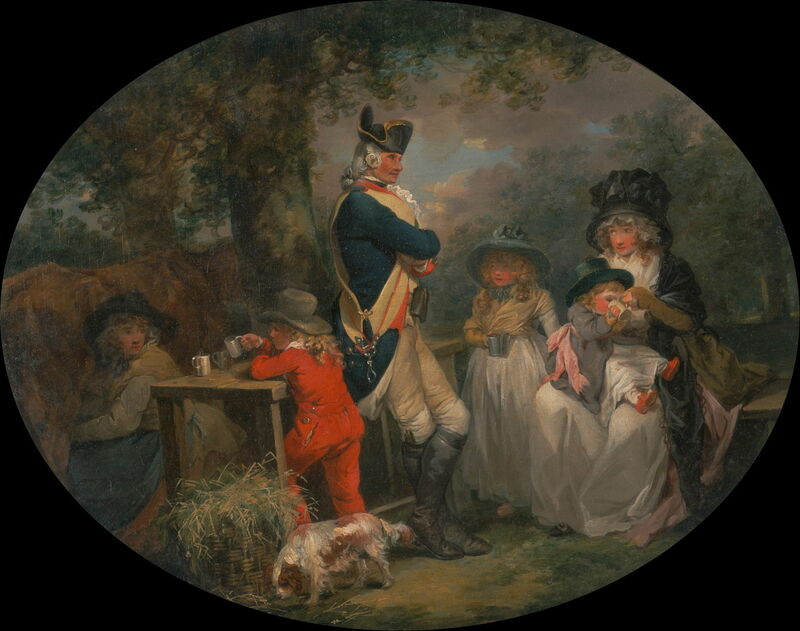 The Soldier’s Return (c 1790) was one of an extended series of paintings which took the themes of military separation, desertion, and loyalty, at a time when Britain had been at war off and on for a very long period. George Morland (1763–1804), Partridge Shooting (c 1790), oil on canvas, 40.3 x 52.1 cm, Yale Center for British Art, New Haven, CT. Wikimedia Commons. 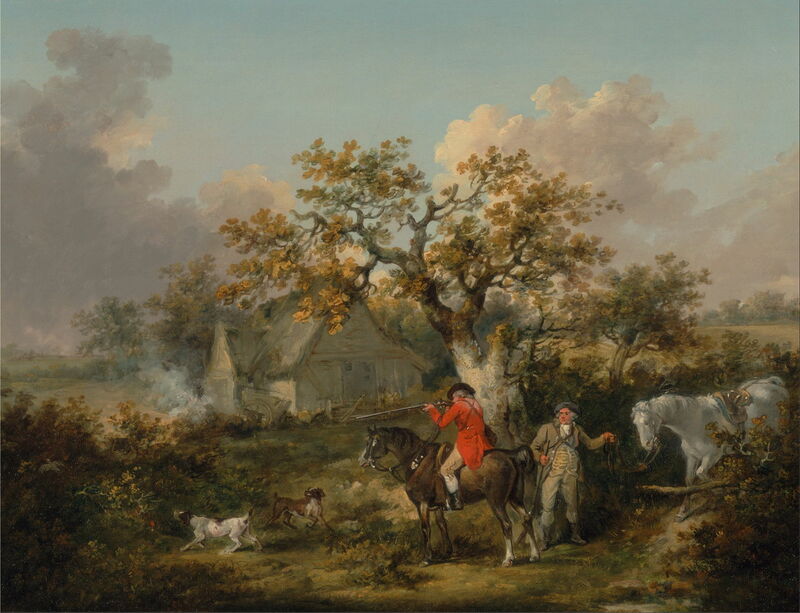 Partridge Shooting (c 1790) is another example of his paintings of sporting pursuits of the country gentry, in which he makes the obvious contrast with the poor farmhouse behind. In 1790, he was invited by the Prince of Wales to paint him “a room of pictures”, but declined the invitation, and ceased accepting private commissions altogether. At this time, he was observed to be capable of painting one of his smaller canvases in just two and a half hours, and then to sell that work for ten guineas (£10.50). George Morland (1763–1804), The Old Water Mill (1790), oil on canvas, 100.3 x 124.8 cm, Yale Center for British Art, New Haven, CT. Wikimedia Commons. In 1790-91, he painted several larger works, of which at least one was exhibited at the Royal Academy in 1791. 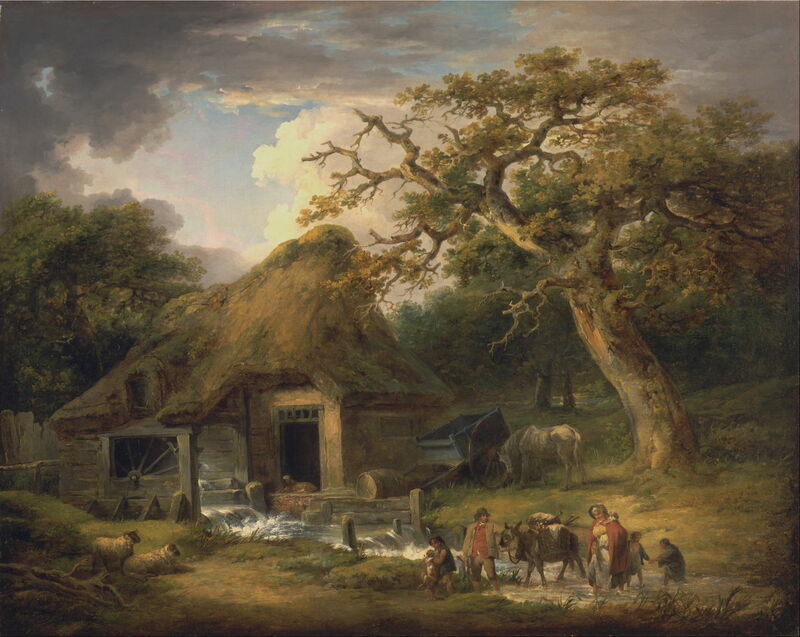 The Old Water Mill (1790) is one of his finest landscapes, and one of his few paintings featuring sheep, which appear to have been the only farm animal for which he did not have deep affection. George Morland (1763–1804), Before a Thunderstorm (1791), oil on canvas, 85 x 117 cm, Hermitage Museum, Saint Petersburg. Wikimedia Commons. Before a Thunderstorm (1791) is another of these larger canvases, showing well the rising wind and threatening sky just before a summer storm strikes. George Morland (1763–1804), Rocky Landscape with Two Men on a Horse (1791), oil on panel, 25.1 x 30.2 cm, Yale Center for British Art, New Haven, CT. Wikimedia Commons. 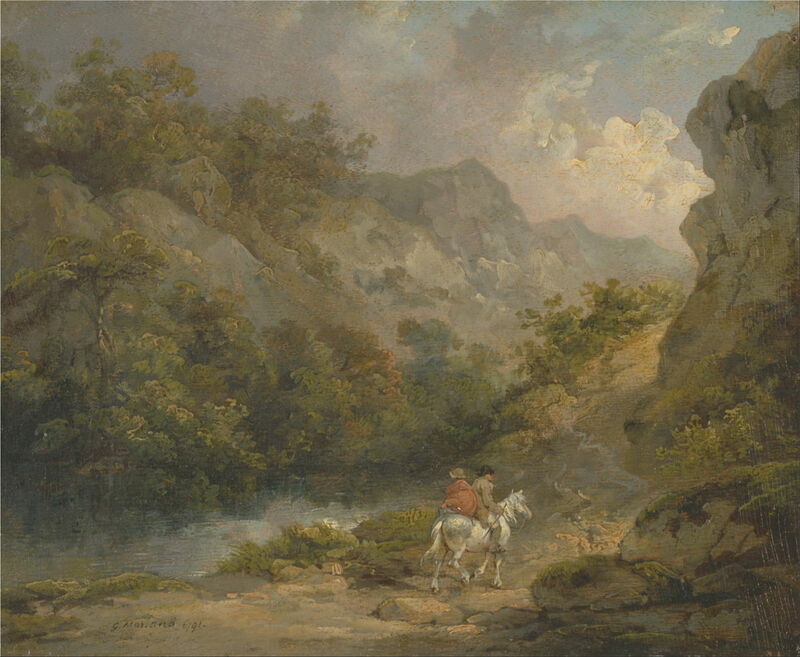 Morland appears not to have travelled much beyond London and the south coast of England, but did paint several views of more rugged countryside beyond, including his Rocky Landscape with Two Men on a Horse (1791). George Morland (1763–1804), Old Horses with a Dog in a Stable (c 1791), oil on panel, 29.8 x 38.1 cm, Yale Center for British Art, New Haven, CT. Wikimedia Commons. 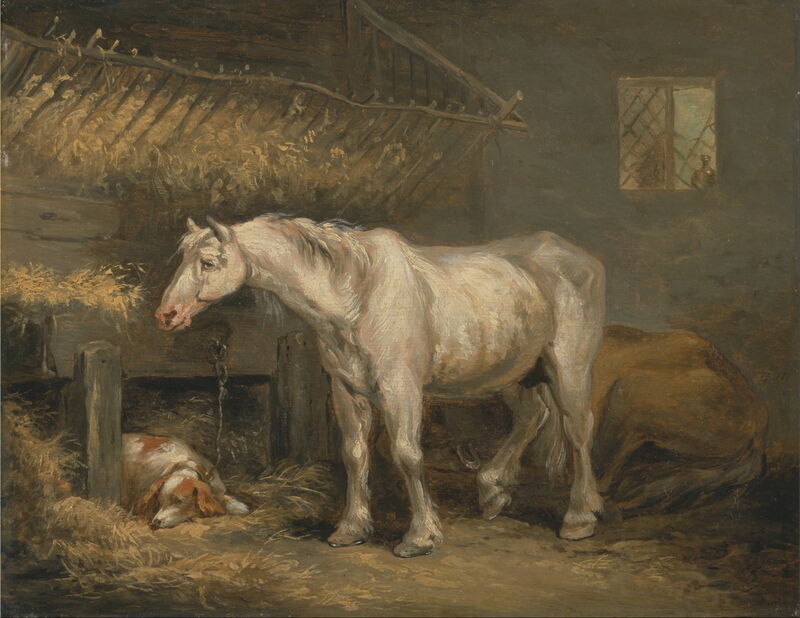 Old Horses with a Dog in a Stable (c 1791) is one of several classic stable scenes. In this, the white horse is shown with great empathy for a working animal now wasted, and soon destined for the knacker’s yard. 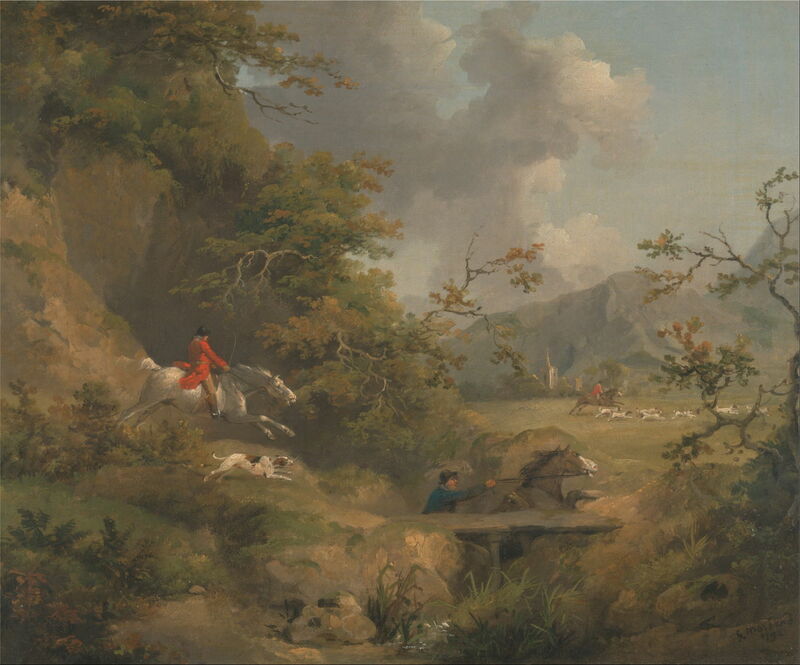 George Morland (1763–1804), Foxhunting in Hilly Country (1792), oil on canvas, 31.1 x 38.7 cm, Yale Center for British Art, New Haven, CT. Wikimedia Commons. 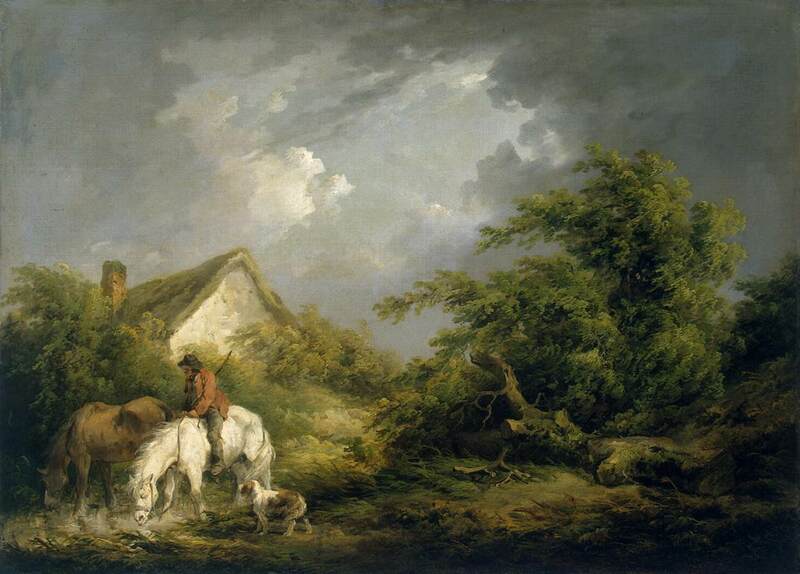 Foxhunting in Hilly Country (1792) is another in his series of country sporting pursuits, where he shows his greater empathy with the animals than the riders. By 1792, over a hundred of his paintings had been turned into engravings, which proved extremely popular and lucrative, although mainly for the publishers. In addition to drinking excessively, he lived a lavish life, at one time allegedly keeping eight horses at the nearby inn. His debts began to mount, and he had to keep moving address to try to keep ahead of them. 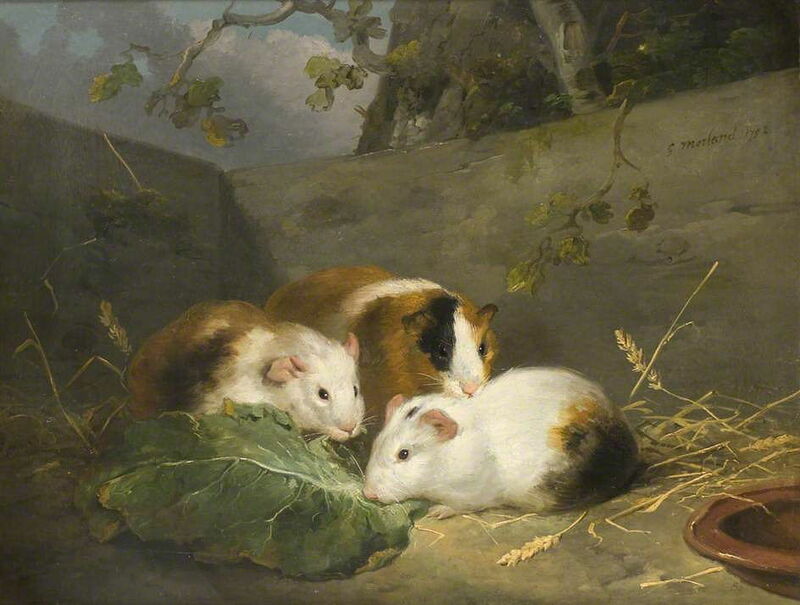 George Morland (1763–1804), Guinea Pigs (1792), oil on canvas, dimensions not known, McManus: Dundee’s Art Galleries and Museums, Dundee, Scotland. The Athenaeum. His painting of Guinea Pigs (1792), as with those that he made of rabbits, are probably the finest depictions of these species by any artist. His dealers were happy to buy and remove his paintings before they were even dry. Once in the hand of some of the less scrupulous dealers, it was common for several copies to be made, and sold as originals. 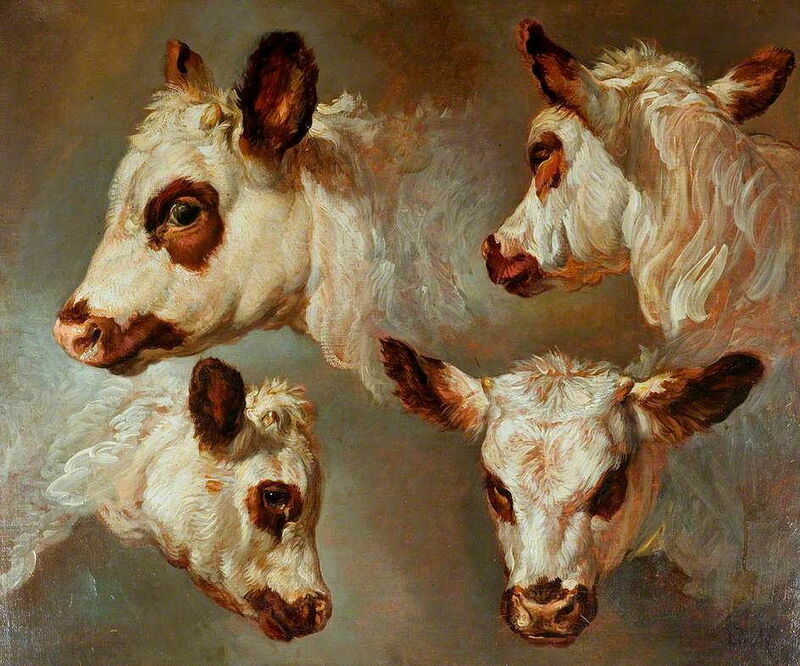 George Morland (1763–1804), Four Studies of Heads of Cattle (date not known), oil on canvas, dimensions not known, The Victoria and Albert Museum, London. The Athenaeum. I have not been able to locate usable images of his paintings of cattle, apart from his exceptional undated Four Studies of Heads of Cattle. George Morland (1763–1804), In Front of the Sty (1793), oil on canvas, 46 × 61 cm, Private collection. Wikimedia Commons. Of farm animals, he appears to have had strongest feelings for pigs. 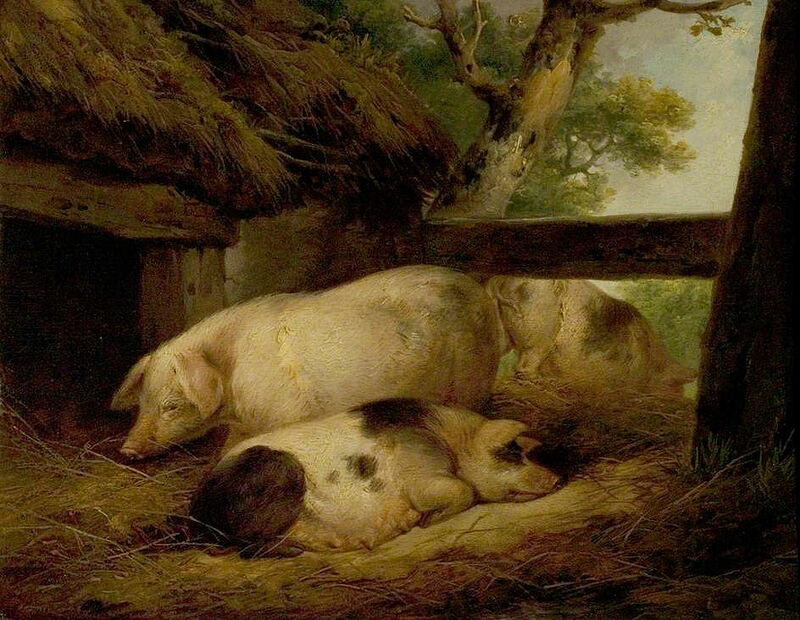 In Front of the Sty (1793) shows what is probably a Gloucester Old Spot or related breed, a sow asleep with three of her well-grown piglets. 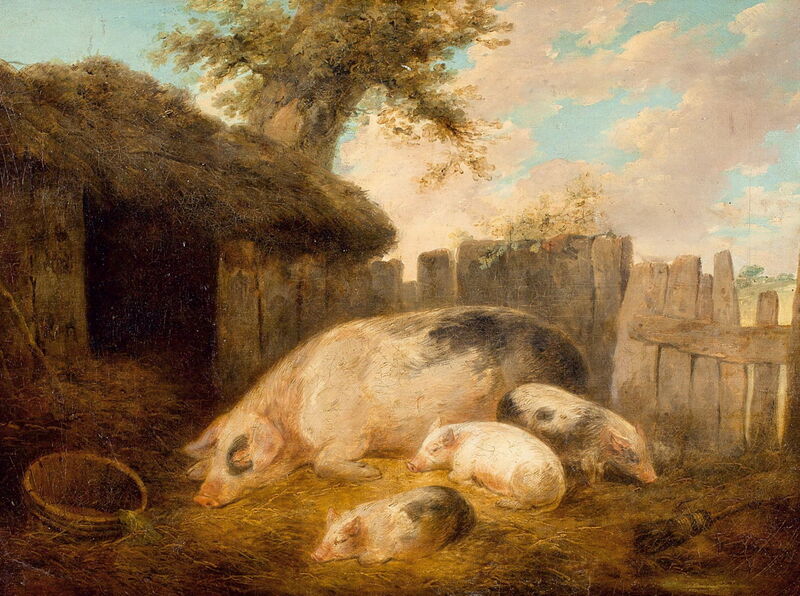 George Morland (1763–1804), Study of Pigs (date not known), oil on wood, dimensions and location not known. The Athenaeum. Study of Pigs (date not known) uses a similar composition, and perhaps breed, with highly perceptive detail. The trunk of the tree in the background appears to bear ‘lungwort’ lichen of the species Lobaria pulmonaria, which is now extinct through the south and east of the UK, but was then commonplace, for example. George Morland (1763–1804), The Ratcatchers (1793), oil on canvas, 32.5 × 35.5 cm, Private collection. Wikimedia Commons. 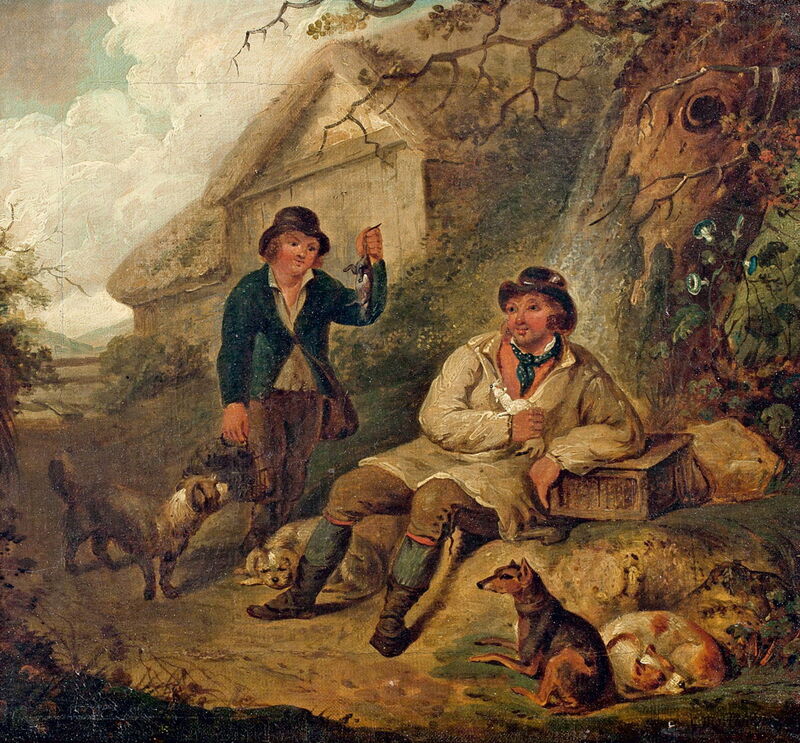 The Ratcatchers (1793) shows a couple of itinerant workers with the dogs they used to catch vermin such as rats, the man on the left holding up one of their successful catches. George Morland (1763–1804), Setters (1798-99), oil on canvas, 33.7 x 22.9 cm, Yale Center for British Art, New Haven, CT. Wikimedia Commons. 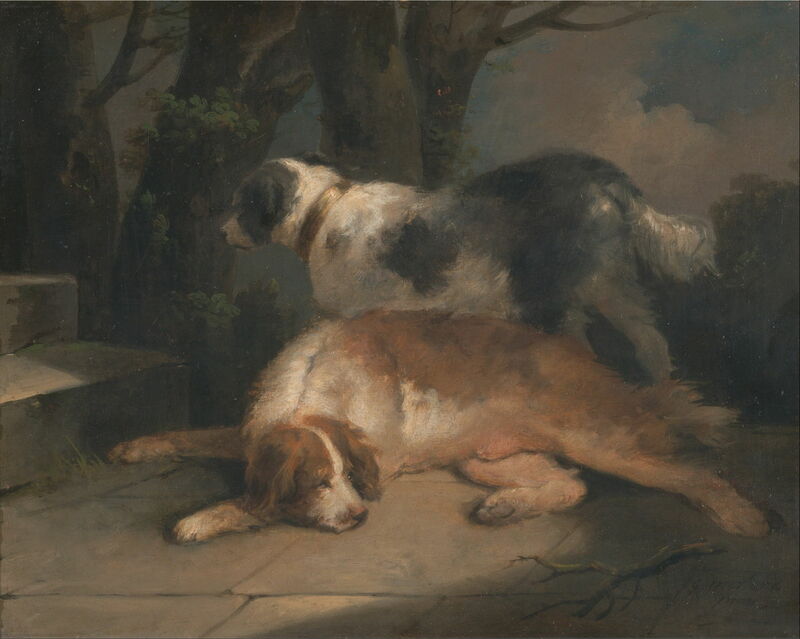 Setters (1798-99) demonstrates Morland’s skills at painting dog portraits, with this fine pair of English Setters. These are gundogs, with ‘soft’ mouths which do not damage the game they retrieve. In 1798, he lived in Hackney, and his quiet and secluded habits, and overheard discussions about printing plates, aroused local suspicion that he might be forging bank notes. His rooms were searched, and the mistake was realised, for which he was given £21 in compensation. In the spring of 1799, Morland and his sick wife spent some time living in their doctor’s cottage in Cowes, on the Isle of Wight. This was a time of heightened national security, and there was great fear of a French invasion. Unfortunately, locals suspected Morland of being a French spy, and when he was observed sketching Yarmouth Castle, he was arrested. When brought before the magistrates in Newport, he was discharged under the instruction that he was to make no more drawings or paintings while he remained on the Island – something which he ignored. When he returned to London at the end of 1799, Morland’s debts finally caught up with him. He was arrested, and would have been thrown into debtors’ prison, but was allowed to remain in supervised lodgings. Although he continued to paint at a ferocious pace, he gradually succumbed to his excessive drinking. When he was released from confinement in 1802, as an insolvent, his health was in decline, and he probably suffered a stroke which made it impossible for him to hold his palette. He was arrested again in 1804, for debts, and died shortly afterwards, a broken man, aged only 41. It is estimated that he painted more than 4,000 oil paintings during his life, and made more than a thousand drawings. Among them were two paintings which served the cause of the abolition of the slave trade. Gilbey W & Cuming ED (1907) George Morland, His Life and Works, A & C Black. Available from the Internet Archive. Posted in General, Painting and tagged cattle, guinea pigs, landscape, Morland, painting, pigs, Reynolds, Volkert. Bookmark the permalink. Fascinated to learn that Morland was not partial to sheep. I have a graphite and watercolour sketch of a shepherd boy and sheep which is quite beautiful. It has an embossed mark for Dobbs & Co in one corner and a couple of printers marks – so I believe it must have been reproduced as a print but can find no reference. That may be misinformed – I took it from a later and more critical account, but there are many disputes over his life and work, including the date and scale of his drink problem. But never fear: there are more animalières to come!